AHL Free Agency: Who is the Right Backup for Jack Campbell? Yesterday's news on the signing of Antti Niemi to a three-year deal unquestionably solidified the goalie position in Dallas. There will be no battle for the backup position as there has been in prior seasons (Raycroft v. Bachman; Rynnas v. Lindback). Niemi and Lehtonen will form a 1-2 punch in Dallas that Nill and Co. hope will put them back into the postseason. 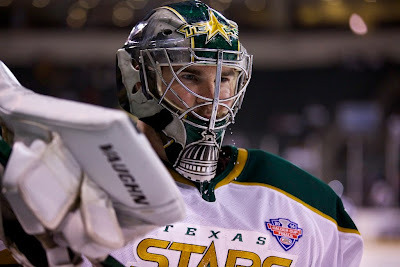 The other bit of information that dribbled out on the signing conference call was the fact that Jack Campbell is expected to play 60 games this coming season for the Texas Stars. * That bring the question of who is the right player to push along and backup a young goalie with a heavy workload like that. Luckily, Texas has some instructive blueprints that they can look at around the league. Very few goalies jump from juniors right into the NHL and many of the most successful goalies in the league today had a season exactly like the one Jack Campbell is facing this year in the AHL. Prove you can be the guy, and we'll give you a shot. So who were the guys behind those guys? What are we looking at for a prototypical 15-20 game backup? First sample case is Corey Crawford. Despite what you might think about his comparison to Chris Osgood or his impact on the Blackhawks ability to win on a nightly basis, he has two Cups and you don't so that settles that. Crawford had a few seasons where he played 50+ games in the AHL, four of them. Campbell may need another season or two after this one to really hit his stride before rolling up to the NHL, based on those numbers. In his first season, Crawford played 60. Mike Brodeur and Sebastien Caron took most of the load behind him with 19 games total. He had alright numbers that season but got better in Rockford, which is where we'll concentrate. In his first year there, he played 55 games with Wade Flaherty getting into 31 of his own. Flaherty, who is now the Jets' goalie coach, was a long-time league veteran. He won the Butterfield Trophy in 2004 with the Admirals and had several backup stints in the NHL, most notably with San Jose and the Islanders. We'll call this prototype 1: veteran with accolades and NHL experience. The next year Flaherty retired and the Hawks brought in some scrub named Antti Niemi from Finland. 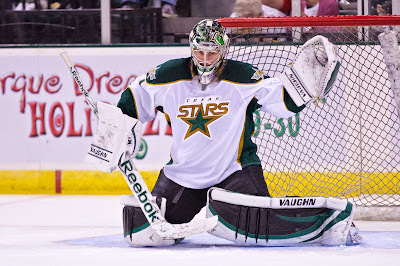 Niemi vaulted Crawford on the depth chart and won a cup with the Hawks in 2009. This is a risky one, but we'll call it prototype 2: European goalie with possible NHL dreams. The final year Crawford had a goalie named Joe Fallon as his backup. Stars fans know Fallon from his time in San Antonio. He was, at the time of his Rockford stint, a rookie. This is prototype 3: low-experience goalie just along for the ride. Next, let's look at the most recent AHL season of Jake Allen. 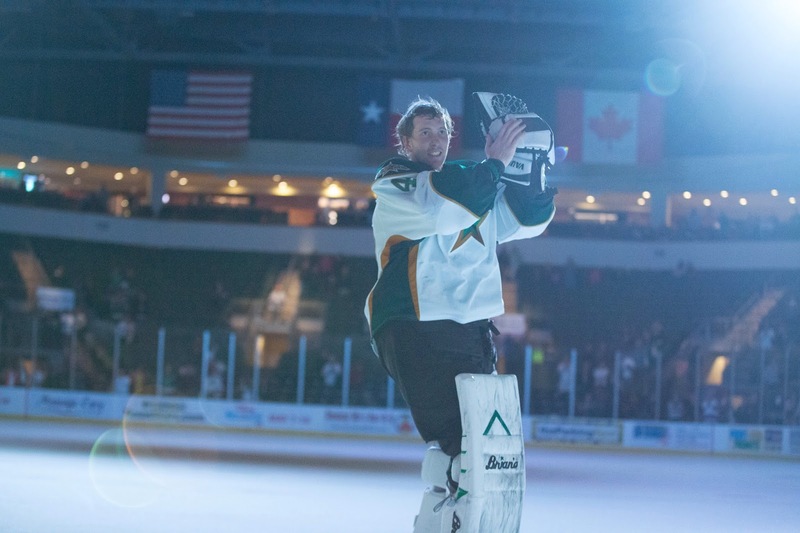 Allen shut down skaters all over the Western Conference en route to the 2014 Baz Bastien award (AHL top goalie). He had a familiar face as his backup, Matt Climie. This is prototype 4: AHL veteran journeyman. I also looked at Corey Schneider for comparison but his backups fit into one of these categories: Curtis Sanford (#1), Daren Machesney and Karl Goehring (#4). What prototype is right for Jack Campbell? First of all, let's list these out. Texas already tried #2 (Nilstorp and arguably Rynnas) without much success. Given that Campbell is still relatively young comparatively, I don't think you want #3 either. In each of those cases, the goalie in question is one year away from the NHL and had already played a 'full load' season of 50+ games. It's not clear Campbell is there yet. So that leaves a veteran goalie with accolades and NHL experience or an AHL journeyman veteran. Either way, you need someone with experience who is probably on the downside of their career. With help from yesterday's AHL Top 100 Free Agent list, here are the top available goalies according to our combined efforts: Richard Bachman, Mike McKenna, Michael Leighton, Tom McCollum, Jeremy Smith, Yann Danis, Scott Clemmensen, Dan Ellis, Rob Zepp, John Muse, David Leggio, Scott Munroe. I don't think the Stars would sign Richard Bachman or Dan Ellis based on past experiences. The top candidates for a prototype 4 goalie are Mike McKenna and John Muse. Texas fans aren't familiar with McKenna as much anymore unless they follow him on Twitter. He moved out East after sometime with Peoria in the early going. He's a solid goalie in the #1 spot, so you wonder if he wouldn't prefer somewhere he can get that workload and the shot at the NHL. John Muse is familiar for Texas fans from his time in Charlotte. Just under 30 games this year behind Drew MacIntyre. He could get a similar workload in Texas behind Campbell. Charlotte, if you'll remember, was not great this year. He was 10-12-2 with a .916 SV% despite that. Scott Clemmensen is a good former NHL backup and now potential AHL veteran backup. He might be looking for a more expanded role or the shot at an NHL backup job somewhere. However, you can't argue with his .918 SV% with Albany. Just signed on to be the Devils goaltending development coach. Another prototype 1 goalie that isn't on the top 100 list is Jason LaBarbera. he went 9-16-7 on a bad Norfolk Admirals team this year. He probably would be OK with the limited role that an assignment to Texas would provide. One note is that he is over 35, meaning he would have a 35+ NHL contract, if he was on an NHL deal. Of course, you never know where a player might come from in free agency, but these are some top options to consider. When Jonathan Bombulie announced earlier this year that he was taking a job in Pittsburgh to cover the beat of the NHL version of the Penguins, one of the things that he left behind was his yearly AHL Free Agent “Big Board” which is a massive list of minor league hockey players ranked, 1-100 and beyond, that debuts right before the start of NHL Free Agency. Well, thanks in part to the efforts of many, it lives on. 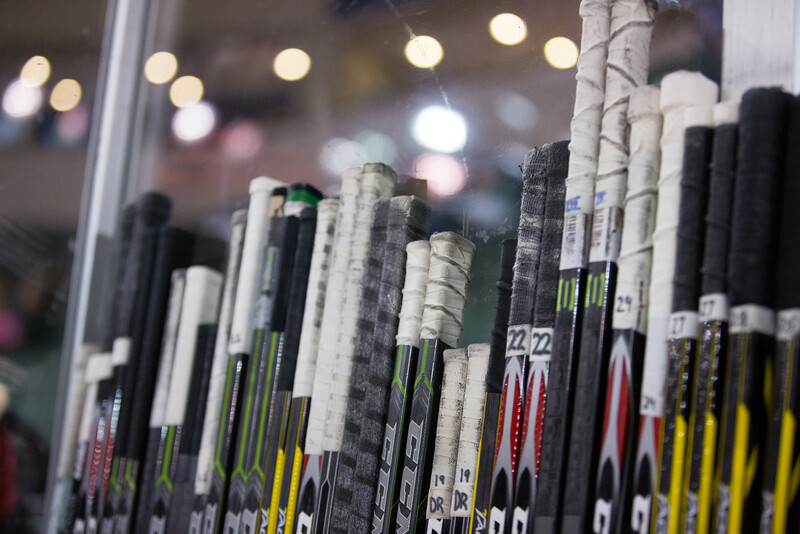 This massive, massive project, doesn’t get completed without the help of a broad spectrum of bloggers and journalists alike, from nearly every corner of the American Hockey League. Jason Iacona (Chirps from Center Ice) connected with several bloggers from throughout the AHL and what you see today is the efforts of those who lent a hand in typing up a capsule on a player from the Eastern Conference that the Western Conference never sees, or vice versa. 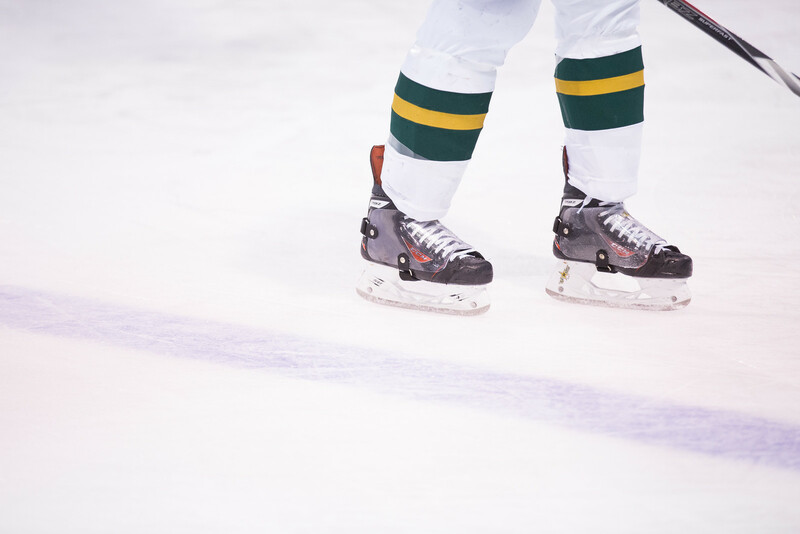 Stephen Meserve from 100 Degree Hockey, who created the spreadsheet that everyone contributed to as well as his thoughts on the Texas Stars free agents. Nathan Mallett from Runnin’ With the Herd, who laid the groundwork for the Top 100 list and contributed greatly to the capsules of the San Antonio Rampage as well as other teams. Heath Sorey of Beneath the Scope, who went above and beyond the call and provided capsules for not only the Anaheim prospects of the Norfolk Admirals team he blogs for, but several other AHL teams. Special thanks to Daniel Lavender (Admirals Roundtable) for his contributions on Milwaukee, Matt Trust (Chocolate Hockey) for Lehigh Valley and Hershey, Tracey Lake (Thoughts Inside the Box) for Albany, Eric Rodgers (Tend The Farm) for Oklahoma City, Darryl Hunt (210 Sports) for Worcester, Jenni Probst (Chasing Checkers) for Charlotte and Chris Roy (Maine Hockey Journal) for Portland. We all hope that you enjoy the list. After the jump, dive into the Top 100 AHL Free Agents Available, then the “Best of the Rest” list below. Note that any Restricted Free Agent not tendered a qualifying offer will be added in on future edits, most likely starting tonight or by noon tomorrow, when the market goes live. 1 Andy Miele C GR Elite AHL scorer. Led a loaded Grand Rapids team with 70 points. 2 Chris Bourque F HFD Perennial AHL All-star was 5th best in league in points. 3 TJ Hensick C HAM Veteran that remains a premier AHL scorer who can score 20 goals in his sleep. 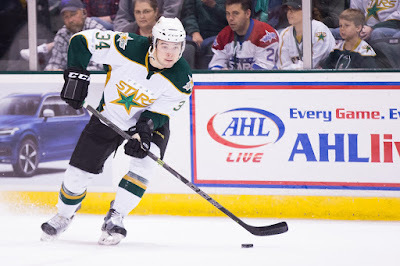 4 Dustin Jeffrey C BRI Perennial AHL all-star who changed the complexion of the forward group. 23 points and a plus-14 in 20 games after the trade for Cory Conacher. 5 Cal O'Reilly C UTI Prolific AHL scorer re-discovered the offense and led the Comets in scoring. 7 Bobby Sanguinetti D UTI Total package offensive defenseman who thrived under Travis Green's system in Utica. 8 Chris Conner LW HER AHL vet not slowing down at age 31, still well over a point a game producer. Still as fast as he was five years ago. 10 Joe Whitney LW ALB Has lead in team scoring all 4 seasons, made his second All Star appearance, and got his first NHL goal with New Jersey on New Year's Eve. Not bad for a 5'6" undrafted free agent. AHL Free Agency: Who Will Step Up as Veteran Defense in Texas? Looking at a rough sketch of the Texas Stars' current lineup for next season reveals a few glaring issues that need to be solved before the season kicks off. Both of them will likely be solved in the next few weeks with the start of free agency on July 1st. The first issue is the lack of a veteran defenseman. Since its inaugural season, Texas has always placed a premium on veteran defense. With the longer development cycle of a blue liner, it's important to have a stalwart presence on the backend to make sure those players develop properly. Also, you need someone who can get out there and play heavy minutes when the inevitable minor issues crop up with younger players and the situation is too important to risk it. Since the beginning, Texas has had Maxime Fortunus. The Stars' most-recent captain was informed earlier this summer that he would not be brought back by the club. With the departure of Derek Meech to Europe and the likely departure of Cameron Gaunce to find NHL work elsewhere, Texas has no one in its lineup with more than 68 games of AHL experience. In fact, the old-timer of the group currently expected in Texas is 19-year old Julius Honka. 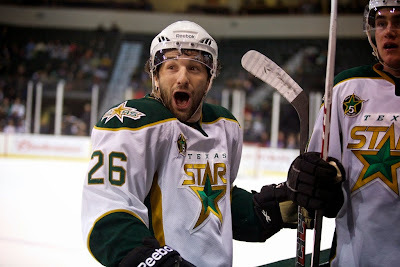 So now the Stars need at least two veteran defenseman with another AHL-ECHL guy to serve as the 7th man. Let's talk options. The first two options are in-house. Cameron Gaunce wants to find a place in the NHL where the depth chart isn't so stacked and he has more of a chance to play at that level. However, maybe if the money is right, they can convince him to stay in Texas. 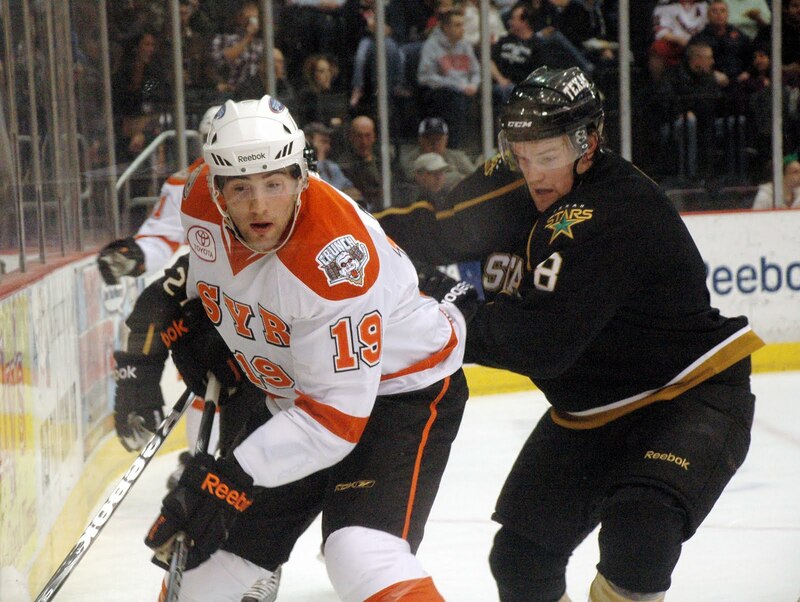 The other option is Scott Valentine, who started the season in Idaho last year due to contract issues with Nashville. Essentially, the Predators had qualified Valentine but then decided not to sign him. That meant he had to sit out the NHL season unless he could find an independent minor league team to sign with. That was Idaho. Scott White had to do negotiating with Nashville to get him to Texas even. Now that he is free and clear, he can sign an NHL or AHL deal with any club. 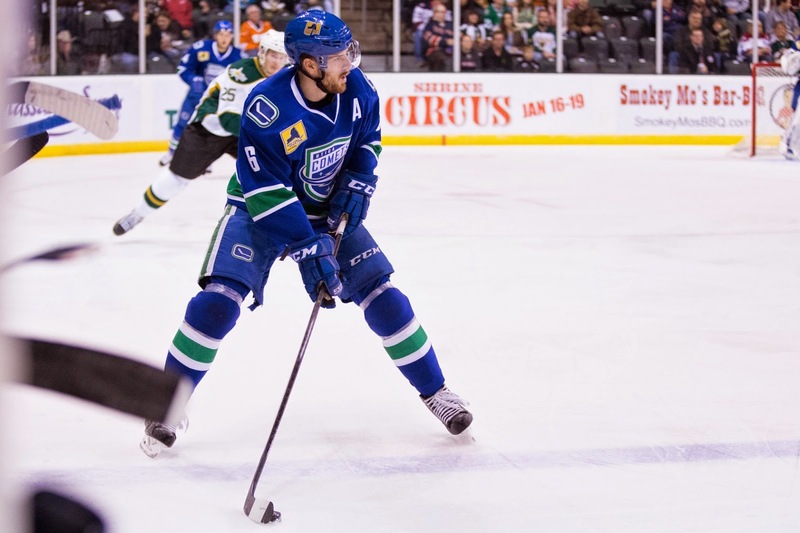 "He’s a solid defenseman in all three zones, a catalyst on the power play and penalty kill, gobbles up ice time, and he makes a good Utica Comets team even better. Utica is one of the AHL’s top defensive teams, even though they’ve used four goalies this season, and Sanguinetti is their leader." The IceCaps D-man was impressive this season (10-38=48 in 72GP) and showed well two seasons ago when Texas defeated St. John's for the Cup. He was a 7th round pick and has never cracked the NHL lineup in four seasons. He's unlikely to do that with Texas, but he could be a very well-compensated veteran for the team. Depending on what Oleksy sees out there in free agency, a trip to Central Texas could make sense. He spent time in Idaho before being snatched up by the Capitals to play three seasons split between Washington and Hershey. This past year he only had one game in the NHL, wore an "A" for the Bears, and upgraded it to a "C" mid-season. 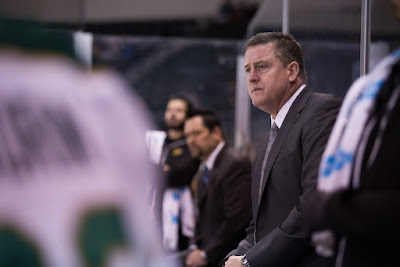 If the connection is to be made, it will have a lot to do with the Stars' head coach, Derek Laxdal. Oleksy began his stint in Idaho during Laxdal's final season there. They went to the Kelly Cup Finals together that year and fell to Cincinnati. Oleksy isn't going to be a flashy D-man -- he only had 4 goals in 68 AHL games this season -- but he will be a consistent presence for the younger guys. The hockey world pivots from the NHL Awards to the NHL Draft tonight in Sunrise, Florida. This year's top pick has been known for several years. Connor McDavid, widely touted as 'The Next One', will be the prize of the draft, selected by Edmonton. Jack Eichel, no slouch himself, is expected to be #2 for Buffalo. Lower down the order, the Dallas Stars pick at #12 overall. In all, the Stars have six picks, one in each round except for the third. To figure out when players are expected to hit the AHL, let's take a look at when the Texas Stars 2014-15 squad was drafted. Year Round Overall Rookie Late season add? * - Not a rookie due to games played overseas but first year in the AHL. So if you look at this chart, you can expect that players drafted this year in the 2015 Draft will start to filter into the AHL as ATOs in 2017 and have a bigger impact in 2017-18. Mike Hedden after discovering you fell for another fake account. This time of year, everyone's an expert. The draft is tomorrow and free agency is soon to follow. Some folks get their giggles by pretending to be famous people on Twitter and reporting fake rumours on trades and free agent pickups. Twitter has had a problem since forever wherein people can claim to be someone they are not. Well, this has been a problem on the internet for all time, come to think of it (hello, 1990s chat room users). In between posting idiotic YouTube comments and making rude remarks about their opponents' mothers on XBOX Live, some folks pretend to be Bob McKenzie, Elliotte Friedman or Pierre LeBrun. A few years ago, Twitter introduced the blue check mark to indicate a verified account. 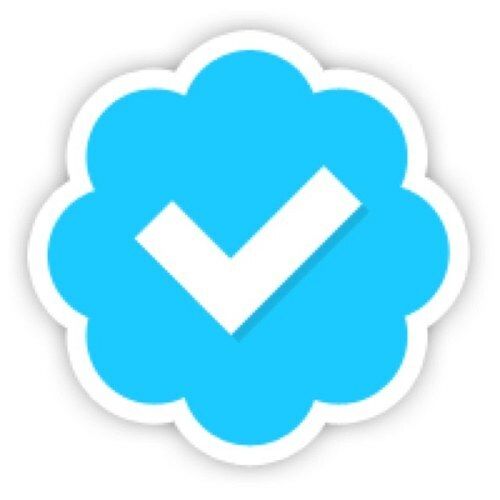 The blue check by your profile means that you are who you say you are. The imeptus for the program was many fold but had its most notable influence from sports. The MLB's St. Louis Cardinals sued Twitter over an impersonator pretending to be the club's then-manager, Tony LaRussa. Interestingly, you can't just fill out a form and get a check mark. Don't call Twitter; they'll call you. When you're deemed important enough, they'll reach out to verify your account. When it comes to NHL news, pretty much anyone who knows anything is going to have one of those check marks. Now AHL... well, that's another story. Take a look at this retweet from yours truly in two different formats you might be familiar with. Now, it just so happens that I am retweeting the actual Bob McKenzie's official account. However, if you just saw that flying by in your timeline, would you think twice about it being legitimate? If you trusted the person doing the retweeting, why wouldn't you? Well, what if the person isn't following Rule #1 above? It, of course, gets more confusing. You'll need to click through to the tweet to make sure it's a verified account because it's not enough to just look at the name, which may not be unique, or the account handle, which can be faked. Can you tell the difference between I and l in a sans serif font? O and 0? Can you tell the difference between these two accounts? The one of the top is the actual Twitter handle, @FriedgeHNIC. The one on the bottom is @friedgeHNlC. That second one replaces a capital "I" with a lowercase "L". Tricky trickses. Remember in elementary school, when the teacher told you to put on your listening ears? Maybe you worked on your critical reading skills too? All that will serve you well in the next week. Writing a tweet or saying something about news that isn't quite news yet, aka a rumour, is a delicate dance. Often times the press has a bit of a negotiation on what info they can divulge even though they may know more. Legitimate sources (McKenzies and Friedmans of the world) will only say something is a done deal when they absolutely know that it is. Saying otherwise can hurt their credibility if something turns sour. Just watch for any unreliable source that jumps on something too quickly or too definitively. Also, if the deal doesn't seem reasonable, that should be a red flag as well. Connor McDavid for Tomas Vincour and a conditional 6th rounder? Not likely. Once you've identified those trusted sources, you should create a Twitter list with all those folks on it. Follow this list on draft day and free agency day to guarantee you only see correct news. 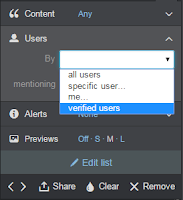 As a bonus for anyone who uses TweetDeck, you should add your list as a column. That column will act as a mini-timeline for only verified information. Well, you know I have to do some self-promotion. We'll cover whatever's relevant to the Texas Stars here. For all your other NHL needs, follow the above tips for some good solid news. One of the ways a lot of folks fall victim to fake tweets is by looking at hashtags or keyword searches. If @TSNBobMcKenzje tweets about something using the #NHLDraft hashtag, you might not take a second look to realize McKenzie was just spelled with a "J". 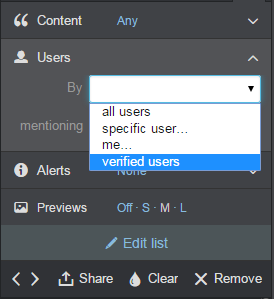 So in TweetDeck, you can setup a column for a keyword or hashtag search. In this column, you can filter by only verified users by using the setting button in the top-right corner of the column. This guarantees Bob McKenzje or EIIotte Friedman won't cloud your timeline with false information. Syracuse is one of three Eastern conference teams Texas has ever played. The draft is this weekend, then free agency, then the doldrums. Soak up hockey while you can. The Dallas Stars have gotten the word out a bit early on some of their restricted free agents. Among the RFAs who played in Texas, Curtis McKenzie and Jamie Oleksiak are expected to receive qualifying offers. 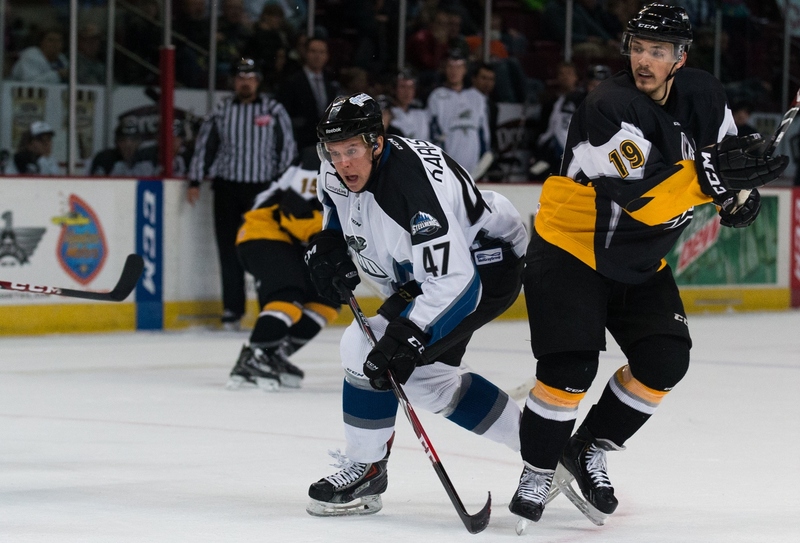 Ludwig Karlsson, who spent most of the season in Idaho, is not expected to get an offer. These were predictable outcomes for most observers. McKenzie made a lot of noise in the bottom six (and sometimes the top six) with Dallas down the stretch. After his AHL Rookie of the Year selection in 2013-14, it was already a pretty foregone conclusion that he would be getting another deal this summer. The only question was if it would be two-way or one-way and the length. While this is only a QO right now, it has to be assumed that McKenzie has earned some length in his contract and perhaps a second year on one-way. I would assume Colton Sceviour's recent contract (two years with the first two-way and the second one-way) is a good example to follow. 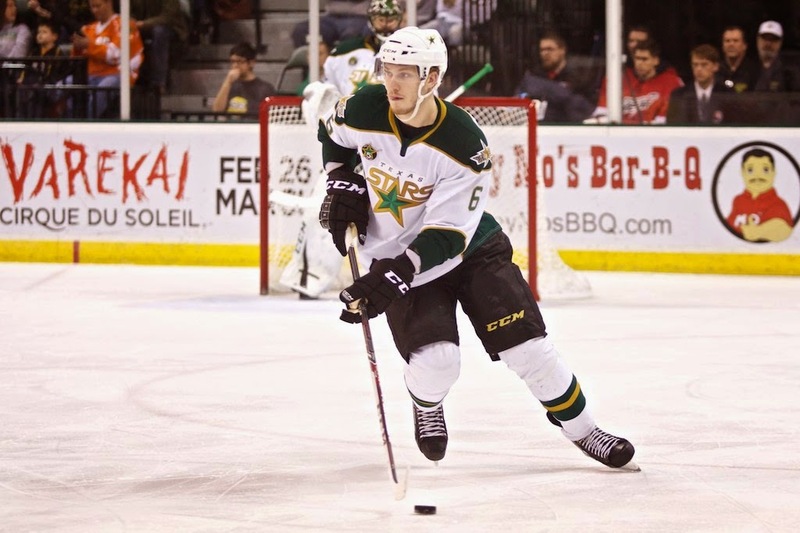 Jamie Oleksiak has been a mystery for Texas and Dallas fans alike at times. While he was a high draft pick, he's been in and out of the lineup in Dallas, unable to establish himself as a daily player. This year's deal is probably of the 'prove it' variety. One-year, two-way with the intent that next summer is the payoff if he can perform to expectations. Ludwig Karlsson spent almost all the year in the ECHL and has spent most of his pro career their as well. He was one of the add-on pieces in the trade that delivered Jason Spezza to Dallas from Ottawa. Karlsson has no points in just 10 games of AHL work over two years. He did perform well in the ECHL during his time there (27-27=54 in 97 GP) and could get a deal there. However, being a Swede, he may also head back to Europe. Interestingly, Karlsson came to America earlier than many European prospects, starting in the USHL before going to Northeastern for two years. Restricted free agent Scott Glennie will not be qualified by the Dallas Stars this offseason, bringing an end to the former first round pick's career with the Texas Stars. Mike Heika broke that news this morning. Glennie was teetering on not getting a contract last season but picked up his play to end the 2013-14 season and was a key contributor to his line with Chris Mueller and Dustin Jeffrey in the playoffs. Glennie can contribute at the AHL level and does not qualify as a veteran yet under the AHL veteran rule. AHL teams, of course, are limited on the number of veterans who can play in the lineup any given night. Injuries plagued Glennie's career with Texas. He missed the start of several seasons due to injuries sustained during training camp or early in the the preseason. Whispers of poor conditioning constantly swirled around the high draft pick. Ultimately, he was unable to live up to the lofty expectations placed on him with the #8 overall pick in 2009. Glennie will be an unrestricted free agent on July 1st. Glennie's agent confirmed they are talking to KHL teams but also that NHL free agency is an unknown, which could bring surprises. Glennie could stay in North America within the AHL, whether AHL only or NHL two-way. Two Texas Stars received contract extensions today as goalie Jack Campbell and defenseman Patrik Nemeth each inked deals today to remain with the Dallas Stars. Nemeth's deal is a two-year contract and Campbell's is a one year. Both players were pending free agents. Nemeth was not expected to play any games with Texas in the 2014-15 season until an arm laceration sidelined his season in October. The hardy blue liner defied expectations to return to playing condition before the end of the season, getting into shape with a stint in the AHL. He also returned for three games in this season's Calder Cup playoffs. 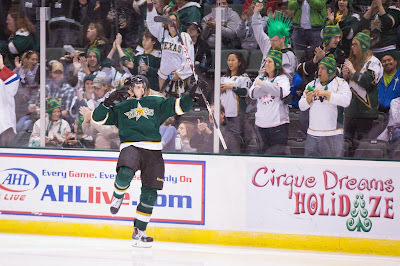 Nemeth, of course, is best remembered by Stars fans for scoring the Calder Cup-clinching goal on this date one year ago. Jack Campbell finds himself with a one-year extension after what was widely considered to be a disappointing season. The 14-15 campaign saw Campbell assigned briefly to the ECHL to figure out his game and regain his confidence by getting more minutes in Boise. After a tough start, Campbell won 11 of his 14 starts to end the season. The first-round pick is expected to play the coming season in Texas in a leading role, if he can hold onto it. This news leaves Scott Glennie, Ludwig Karlsson, Curtis McKenzie and Jamie Oleksiak as the remaining RFAs for Dallas (who played in Texas) ahead of the June 30th QO deadline. Dallas Stars General Manager Jim Nill announced today that the club has signed defenseman Patrik Nemeth to a two-year contract extension and goaltender Jack Campbell to a one-year contract extension. Per club policy, terms of the deal were not disclosed. Nemeth, 23, recorded three assists (0-3=3), six penalty minutes and 16 shots on goal in 22 games with Dallas during the 2014-15 campaign. The defenseman missed 52 games after suffering an arm laceration on Oct. 18 vs. Philadelphia. The Stars were 14-6-2 in games in which he played. The blueliner appeared in eight regular-season American Hockey League (AHL) contests with Texas, tallying two points (0-2=2) and six assists. He also registered one assist (0-1=1) and shared the team-lead with a +2 rating in three Calder Cup Playoffs games. "Patrik gives us a physical and smart player that makes good reads and has a strong net front presence," said Nill. "After suffering such a serious injury, his drive and determination to return to action before the season ended was quite remarkable and he made a solid impact upon returning. We know he'll be ready from day one of training camp to come in and strengthen our back end." Campbell, 23, posted a 14-14-5 record with a 3.03 goals against average, a .907 save percentage and two shutouts in 35 regular-season games this season for the Texas Stars, Dallas' top development affiliate in the AHL. He also appeared in one playoff contest and posted a 3.03 goals against average and a .889 save percentage. Additionally, he played seven games for Idaho of the ECHL and went 5-2-0-0 with a .945 save percentage and a 1.73 goals against average. That awesome moment happened 365 days ago. I still get chills. Here's the original post I put up that night celebrating the win. Read a few tweets and relive the moments with this post highlighting a bunch of social media from that night. 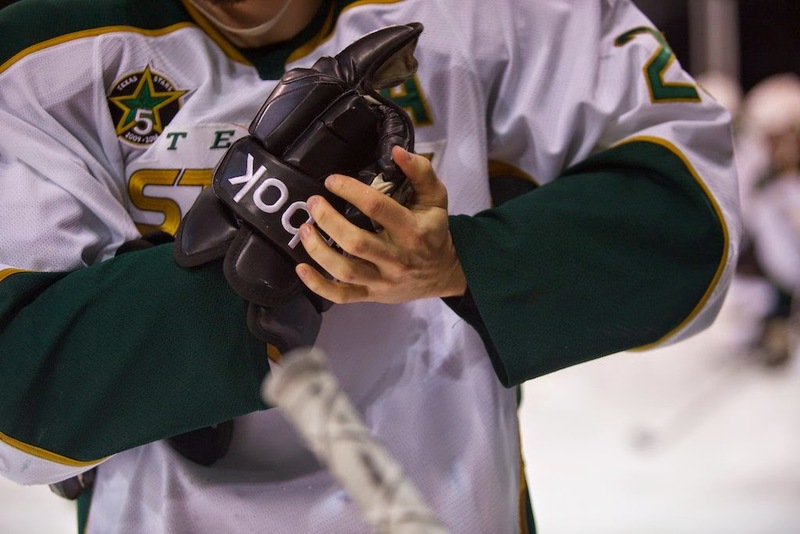 This Twitter search for #txstars on the few days around the win has a lot of great tweets as well. They would return home on that Thursday to celebrate with their fans. Don't forget the full video of the celebration. Per Mark Stepneski, the Dallas Stars have placed goalie Jussi Rynnas on unconditional waivers. The move frees him from him NHL contract obligations for the coming season and allows him to make a move to Ak Bars Kazan of the KHL, where he reportedly signed a contract earlier this week. The Dallas Stars have placed goaltender Jussi Rynnas on unconditional waivers. The move leaves Dallas frighteningly low on experience at the goalie position. Among signed goalies for 2015-16, there are 511 games of NHL experience. 510 of those are with Kari Lehtonen. The Texas Stars announced this morning a complete rebrand of their franchise to match the Dallas Stars color scheme, including the addition of victory green to the palette. 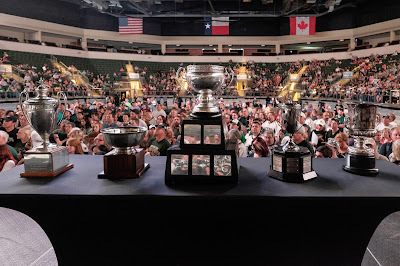 "The colors and themes have worked so well in Dallas, and they've become synonymous with Stars Hockey," said Dallas Stars and Texas Stars owner Tom Gaglardi. 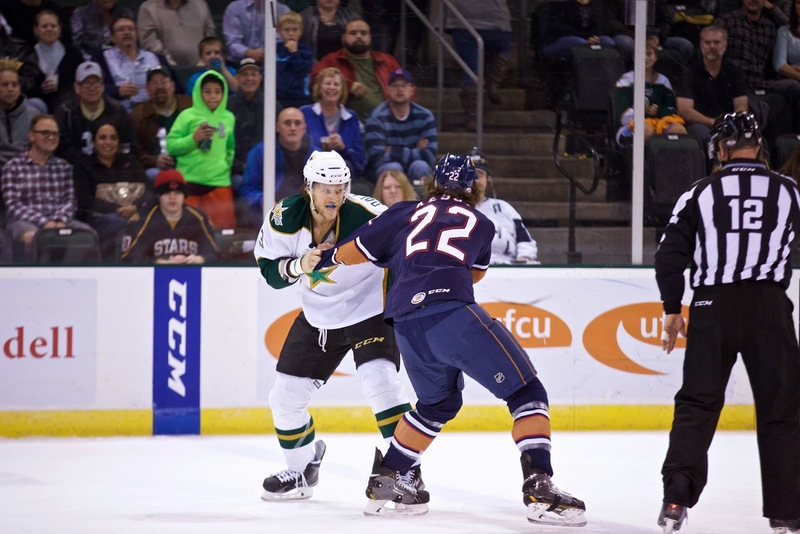 "It's exciting for us to have the Texas Stars represented in the same victory green that we take great pride in." 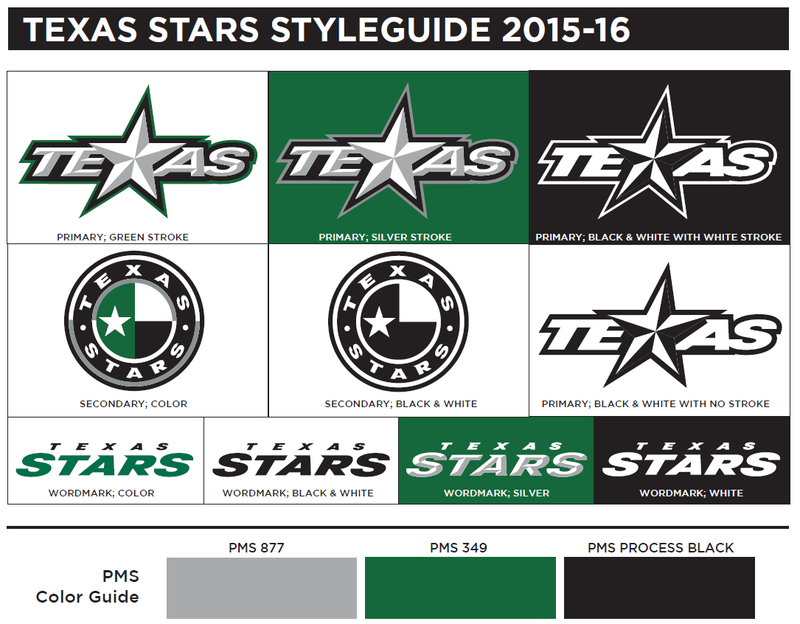 The color scheme change was expected after the Dallas Stars' owner, Northland, purchased the Texas Stars last season. With the change, Texas has completely abandoned the gold trim that was part of both Dallas and Texas jerseys in the past. Texas has revamped its website and all connected collateral with those assets launching this morning as well. 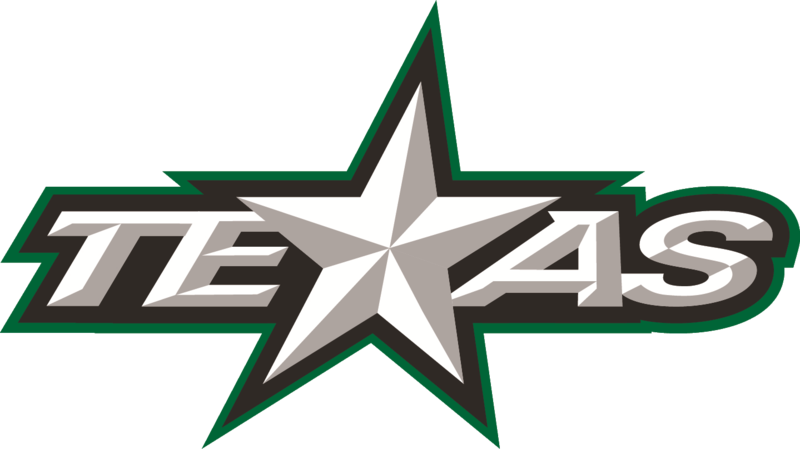 The Stars primary logo is a modified version of the TEXAS secondary logo from the last two years, with the X replaced by a star. 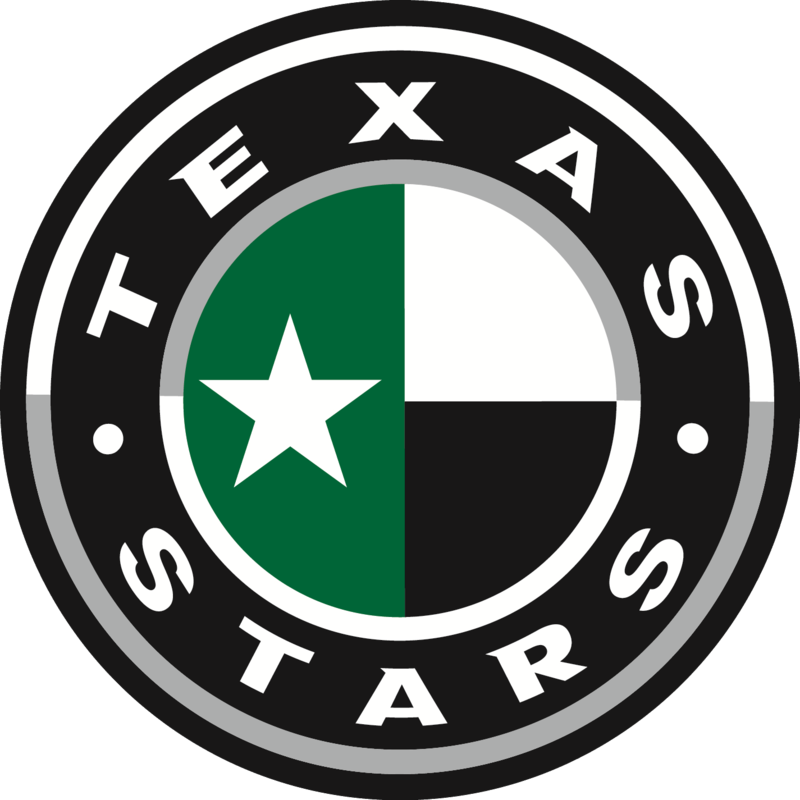 The secondary logo is a color-adjusted version of the Texas state flag in a crest with the Texas Stars name around the outer edge. New wordmarks were also unveiled. Along with the logo, new jerseys are expected later this summer. It is also expected that Texas will compete in these new jerseys in the 2015-16 season. Texas has had two main jersey treatments in their history, the initial TEXAS and STARS wordmarks on white and black respectively and the current kelly green and gold jerseys. With victory green such a big part of the rebrand, it can be expected that Texas will don that shade in some regard next season. 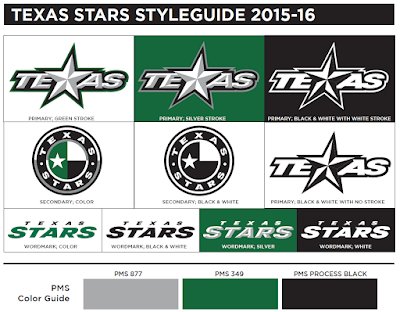 For the Dallas Stars, victory green is the home jersey. See below for the full style guide. Click to expand. It's been a few weeks now since the league announced that the Texas Stars would be playing in the Pacific Division next year. While everyone hoped for the best, last week the news came out that the California-based AHL teams would be playing fewer games than the rest of the league. Now that it's had time to settle in, here's a modest proposal to even things up. First of all, it might be necessary to establish why exactly an evening up is necessary. If your jimmies are already sufficiently rustled on this topic, then you can skim this section. However, if you aren't sure of all the implications of the shorter schedule for these sun-loving clubs, read on. It isn't clear at the moment how many games the California Five will play. The Original 25 will play the usual slate of 76 games, which has been the standard for four years now. 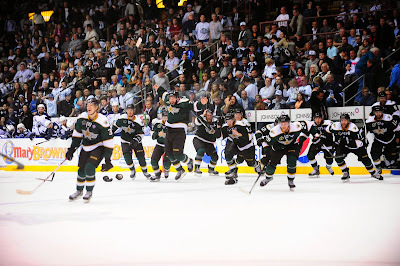 When the Stars entered the league, it was 80 games but dropped in 2011-12. The best guess at this point is a 68 game season for the California Five. The main argument is the wear and tear factor. Eight fewer games means eight fewer chances to put your body through the stress and strain of an AHL game. That also represents eight fewer chances to get injured. It's just a numbers game with many injuries and obviously the fewer games you play the less chance you have to get injured. With fewer games come fewer three-in-threes. The dreaded trifecta of weekend games that test the body and mind of players, coaches and fans alike. While the travel could be pretty easy for any three-in-threes that did occur, part of the reason there are so many is that the league wants to concentrate games on the weekends to maximize the gate. With NHL-owned affiliates caring less about gate and more about on-ice development and not needing to pack in as many games, the battle of 3-in-3s could diminish or disappear entirely for the California Five. Travel is an obvious advantage for the Five, but it is no more so an advantage than many Eastern Conference teams. However, those teams only have to travel to 34 roads games a year in our hypothetical season, as opposed to 38 for the Eastern clubs. With fewer games also come the chances for more rest days for veterans and players who are banged up. As playoffs approach, that becomes more important and means that a club with more open days would be unfairly advantaged as it is able to give more off days and be more prepared for the playoff run. The playoff run, of course, is where the disadvantage is squarely set on the Stars and Rampage. The Texas-based clubs will play a full slate of 76 games, including frequent travel to California across two time zones, to prepare for the playoffs. All of the above factors combine to give Texas and San Antonio a pretty rough ride in terms of that first round matchup, if they even make the playoffs at all. With the number of games being uneven, most have guessed that the league would use points percentage to calculate who makes the postseason. That would be consistent with what the ECHL did when the San Francisco Bulls unexpectedly folded a few years ago and the league couldn't get everyone to play the same number of games. That means that a win for Texas or San Antonio is worth two points out of a possible 152 (1.32%) but a win for a California club is out of a possible 136 (1.47%). This means that every point is not worth the same amount. So maybe it should be. My radical proposal is to base playoff qualification on points alone. In three of the four divisions, this won't matter one lick. In the Pacific Division, this evens up the playing field for the Texas-based teams. For this simulation. I took the records of all seven Pacific teams for the past year and combined them. I had to do a bit of massaging and change the teams that some were based on to make things more representative of a typical year. With these teams actually playing each other, they wouldn't have this many points among them. Our division, at first glance, would have five teams that made the playoffs in 2014-15 all with points percentages north of .579. That's atypical. Therefore, Worcester, which made the playoffs with a .579, is replaced with Lake Erie's numbers for the San Jose sim. A decent team at .539, but not a playoff squad. Second, Manchester had a phenomenal season. That is likely unrepeatable, much like the Stars' 2013-14 season. Instead, I based Ontario's simulated season on the Hershey Bears, who had a pretty great 100 points and won their division. This table is nicely sorted since everyone's played the same number of games. Ontario plays Bakersfield in round one and San Antonio plays Texas. Winners move on to play each other and then go to the WCF. Now let's subtract some games from the California teams. Alright, great. Same matchups since this sorting is based on points percentage. However, as we mentioned before, those California teams had an easier road to hoe to get to the playoffs. Let's flip it around and base this on points alone. Same teams make the playoffs, but look at that shift. The Texas teams, who were disadvantaged all year, get an obvious boost in the standings from the change. Because Texas and San Antonio had good years, they even earn home ice advantage in this scenario. Now the first thing you're probably thinking is, "Well, of course you are going to do the math this way. It makes it a near certainty that the Stars make the playoffs every year!" While that is true, this does make it more likely, my reply would be that this is the price that the California teams pay. Their NHL parent clubs accepted no concessions in their move to the West and got their way with a lessened game schedule. In return, they will have to fight harder for the two playoff spots that they will likely have available. Of course, they'd probably rather just be practicing. Is this going to happen? No, don't think so. Is it better than just accepting whatever the NHL hands you? Probably. Derek Laxdal is setting an example across the pond with one of his former players. Darrell Hay, who played three seasons with the Steelheads under Laxdal, has just picked up his first assistant coaching gig with the EIHL's Sheffield Steelers. 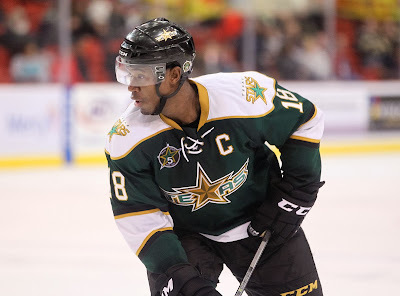 The Texas Stars will have their fourth captain in seven years this fall with news, first reported by Sean Shapiro, that defenseman Maxime Fortunus will not be re-signed by the club for the coming year. The AHL veteran was one of just two remaining original Texas Stars on the club and had been its captain since the 2012-13 season, which saw the arrival of Willie Desjardins and the NHL lockout. Fortunus is second overall in games played in franchise history, totaling 402 contests over six years. Only Travis Morin has more in a Stars' sweater (408). 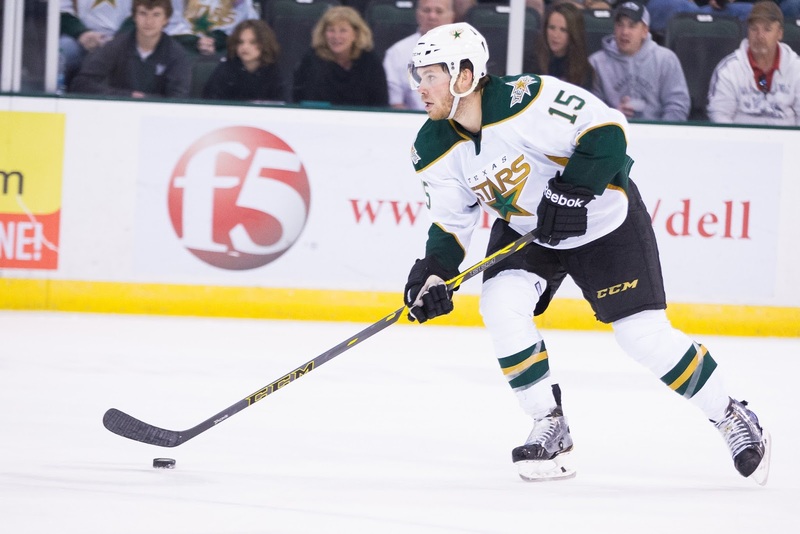 Fortunus came to the Stars already a wily veteran thanks to a stint in Manitoba where he played in the Calder Cup Finals the year before Texas' inaugural season. Fortunus would play in two Calder Cup Finals with the Stars, losing to Hershey in 2010 but defeating St. John's in 2014 as the club's captain. Fortunus will certainly find a job somewhere in the hockey world, but it's an open question if that will be in the AHL or elsewhere. At this point, he has not ruled out Europe as an option. However, as he always has said during his time in Texas, he wants to put his family first. He's still in town this week as his oldest finishes up the school year before heading back to Canada for the summer. With the departure of Derek Meech, Fortunus and likely Cameron Gaunce, the Stars are in a bind when it comes to veteran talent on the backend. Among currently signed players, Julius Honka has the most AHL games played at 68 regular and three playoff contests. Scott White will have to be working the phones one month from today to ensure his promising pack of blue liners that includes Esa Lindell, Mattias Backman and Ludwig Bystrom has a mentor of the calibre of Fortunus or Meech. White has always placed huge value on the defensive group in Texas, so he likely has a plan. However, it is surprising to say the least that Maxime Fortunus is not part of it this season.